Written by Darren Quinnell with input from the CVM team. 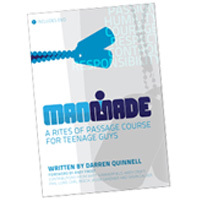 In a society where manhood is rarely understood, ManMade is a resource to help teenage boys become young men. Boys rarely mark the transition into manhood, they simply drift into their adult life. ManMade is a resource that unpacks this transition with six core vaules, based on the life of Jesus. ManMade combines practical activities and discussion starters within a Biblical framework. The course gives teenage boys a coming of age experience, with significance that speaks directly into their lives. For UK Mainland deliveries only, for other destinations please contact the CVM office. dicussions starters within a Biblical framework. experience, with significance that speaks directly into their lives.